Like most techies I like to learn new things, so today I decided to begin a journey into Big Data! Inspired by Mr. Bennie Haelen I decided to look into a bit of a different flavor, Cloudera. Setting up the environment was something I had not done since doing some Java programming back in the day. I have a Windows 10 box, running 64bit OS with 8GB RAM on a laptop. It’s not very powerful, but it’s what I use at home and it’s been fine for my personal development tasks and remote connections to client sites, and work. Anyway, I had to download the VMPlayer for Windows first. Once that was installed, I needed the Cloudera environment to run on the VMWare and 7Zip. 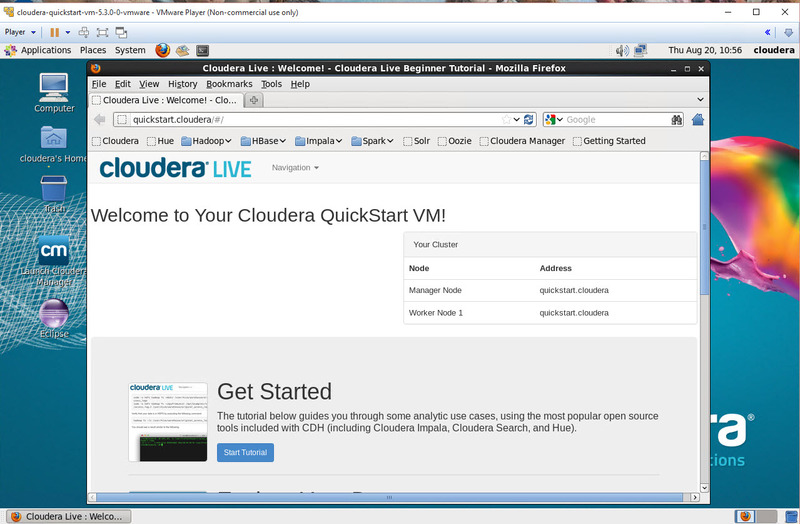 After installing 7Zip, and VMWarePlayer on the machine, I was able to unzip the Cloudera demo VM. After a while, the VM ended stopped on this screen. Tomorrow, I’ll start digging into the Get Started section and see what this is all about. For more information on the very technical and smart guy side of this, check out Bennies blog for more.